The skin is so important and being such a big organ it requires a well thought out diet, however this has not got to be complicated as folk remedies and foods come together to offer healing benefits. The following list is not exhaustive yet will provide many products to choose from to either start the healing process or to maintain an already healthy skin as you age. Apples provide vitamin C which is essential for production of collagen, a protein that aids in the growth of cells and blood vessels and provides the underlying structure to the skin; copper, which aids the production of melanin, the pigment that colours skin and protects it from the sun’s UV rays; and vitamin A, which plays a key role in skin development and may reduce the risk of skin cancer, although more research is needed on this aspect. The old adage ‘an apple a day keeps the doctor away’ is a truism although our lovely doctors are nice people the apple can cut down their work load as it offers so much healing. Avocados contain productive levels of vitamin E, which protects skin from cell damage and supports healthy skin growth; and biotin, which helps guard against dry skin and brittle hair and nails. Also present are vitamins A and D, and omega-9 fatty acids. The oil applied topically can hydrate parched skin always ensuring you apply the oil to dampened skin as it will absorb much better than applying to dry skin. The vitamin E and flavonoids in almonds are vital to skin health. They are a powerhouse of nutrients and palatable. This nutritional powerhouse contains vitamin C; iron, which is needed for growth, development, and cell function; manganese, several B vitamins; magnesium; potassium, zinc, copper; selenium; and folate, which encourages healthy skin and hair. It is absolutely essential you have fresh not pickled beetroot found in cans on the supermarket shelf as the vinegar is very drying to the skin. Raw grated beetroot mixed with a natural yoghurt is sensational as an accompaniment. These delicious morsels are rich in anti-inflammatory agents and vitamins that help guard against premature ageing. The antioxidants in berries help minimise the harm caused by free radicals, which can accelerate wrinkle formation and lead to disease. Additionally, berries are packed with vitamin C, which keeps skin firm and strong. They do have a very short life so make sure they are refrigerated and buy in small amounts, often. Brazil nuts are a superb source of the powerful antioxidant selenium, which works in concert with other antioxidants such as vitamins E and C and is essential for the immune system – and you need just four nuts to obtain the recommended daily intake. Research indicates selenium can help to protect against sun damage, age spots and skin cancer. Mix with almonds to get a little variety and or make into a paste and mix with salad. Loaded with nutrients, cabbage and other cruciferous vegetables contain high levels of sulphur, which is essential for keratin, a protein needed for healthy hair, skin and nails. If you develop gas when eating leafy greens just line the steam with blotting paper to help reduce this uncomfortable response. 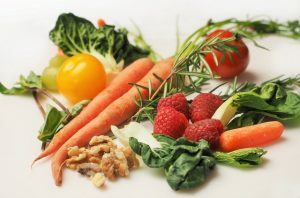 Carrots are rich in carotenoids, and people who eat plenty of carotenoid-containing fruits and vegetables (those that are orange, yellow and red) vegetables have more yellow tones in their skin, according to a 2011 UK study, which gives them a complexion rated by others as appearing healthier. Grated raw carrot is fantastic and in particular mixing grated carrot and apple and adding the paste of brazil nuts and almonds is a very impressive medicine to aid the skin to rejuvenate and look healthy. Capsicums are a particularly good source of vitamin C and also well-endowed with carotenoids. A study published in the British Journal of Nutrition found that people who ate the most yellow and green vegetables (up to 250 grams daily) had fewer wrinkles, especially in the crow’s feet area, compared to those who ate only 69 grams daily. Now that is a good thing to know don’t you think? This low-kJ vegetable contains vitamins B and K, which are required for maintaining and repairing skin cells. Also present are vitamin C and folate, and the skin-friendly minerals calcium, magnesium, phosphorus, and a source of organic sodium, selenium and potassium. Citrus is a renowned source of vitamin C, but it seems we should be eating the skin as well as the flesh as a 2000 study[i] suggests it protects against squamous cell carcinoma – and the more we eat, the greater the protection. This effect was not evident with the juice or flesh. The d-limonene content is thought to be the reason. Remove the pith (the white stuff under the skin) finely slice the peel and add to salads or sprinkle over steamed veggies. Another excellent source of vitamin C and vitamin A, kale also offers an abundance of lutein and zeaxanthin, carotenoids that absorb and neutralise free radicals created by UV light – including the wavelengths that penetrate sunscreen and reach the skin, research published in Clinics in Dermatology found. Omega-3 essential fatty acids must be obtained through food as they cannot be made in the body. Oily fish such as salmon, maceral and sardines are excellent sources and they’re also found in flaxseeds and flaxseed oil, chia seeds, hemp seeds, walnut oil and mustard oil. Omega-3 fats encourage the body to produce anti-inflammatory compounds, which can benefit the skin, particularly inflammatory skin conditions such as eczema and psoriasis. Pears are full of vitamin C and fibre, a crucial nutrient for the skin as it slows the release of sugar into the blood, thereby helping to preserve collagen as repeated sugar spikes can damage it. They must be eaten only when ripe so the spoon test is important. If you can eat off a spoon then it is ripe. If the pear is not fully ripened then the nutritional value is not present. Although this list is not exhaustive there is certainly enough food to start your way back to skin recovery or to maintain a healthy glow that only a well-nourished skin can provide.